Instead of using pdfToolbox Server in hot folder mode (Working with hot folders in pdfToolbox Server), it can also be used integrated in Enfocus Switch or Laidback Solutions FileTrain. This article provides an introduction to how pdfToolbox can be used in such tools. FileTrain from Laidback Solutions is an automation tool that allows automation of manual tasks such as file moving, renaming, moving from and to FTP servers, database access, etc... It also has a built-in integration of pdfToolbox Server. After installing pdfToolbox Server or CLI on the same machine as FileTrain, FileTrain's built-in pdfToolbox action allows running preflight profiles or process plans on files in a "station" (the name for FileTrain automated workflows). The list of FileTrain "stations" (automated workflows). The pdfToolbox action editing window. 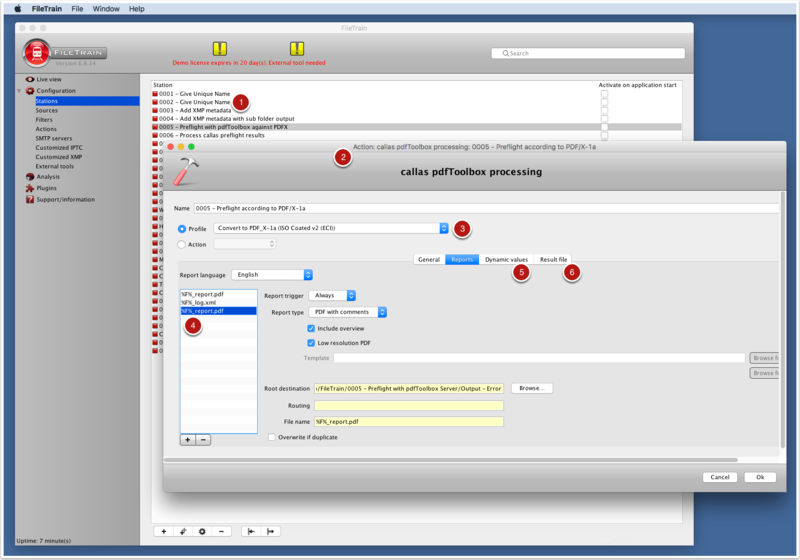 The profile used in this particular workflow; all pdfToolbox profiles and process plans can be used. FileTrain offers a convenient interface to generate multiple preflight reports in different versions. The "Dynamic values" tab allows passing on variables to the selected pdfToolbox preflight profile or process plan. This enables each file to be treated differently, for example based on information that has been extracted from a database (FileTrain has a built-in action to do database access). FileTrain allows very fine-grained selection of where the result file will be generated in the "Result file" tab. Switch from Enfocus is a modular automation solution that can automate manual tasks; it includes both built-in tools (for FTP, renaming, grouping and ungrouping...) and connects to third-party tools. From the start, Switch has had a number of pdfToolbox configurators (the Switch name for the plug-ins that create a connection to a third-party tool). The list of flows (the Switch terminology for a workflow that automates a series of tasks). The list of built-in tools and configurators; at the top in the favorites section, three of the pdfToolbox configurators. 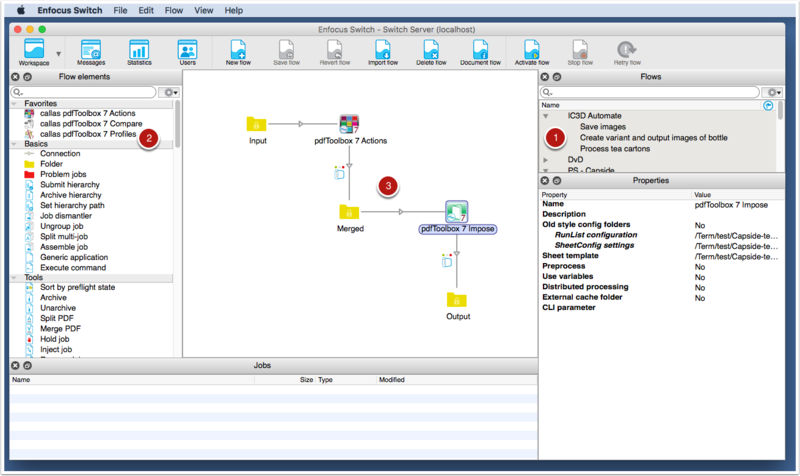 A workflow featuring two pdfToolbox configurators to automatically merge PDF files into a single file and subsequently impose them using the imposition engine built into pdfToolbox. Actions: runs one of the pdfToolbox actions (roughly equivalent to the functionality available in the Switchboard). Profiles: runs a pdfToolbox profile or process plan. Compare: compares two incoming PDF files and determines whether they are visually the same or different. Impose: runs the pdfToolbox imposition engine. ConvertColors: runs a color conversion using pdfToolbox.